Drawing Pencil on Canson Acid Free Paper | 20" x 26"
Drawing Charcoal on Canvas | 18" x 18"
Painting Oil on Canvas | 30" x 48"
I can’t see any humanity in city life, there is no peace. It is all a rat race. It is in the villages that you see real humanity living in peace. I am inspired by the cycles and auto rickshaws in a busy city. Every time I look at a cycle, it appears to be a new one to me; in a way, it is the cycle of life. I use strong black lines to create the illusion of rush and mayhem, whereas deep red adds to my composition. In general, I try to portray unrest. I aim to create objects using minimum strokes. I dream of the cycle of life transgressing backwards, from crowded cityscapes to the lush green landscapes of serenity, the never ending green. 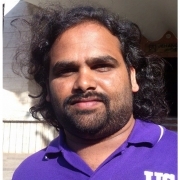 Sujith Kumar G. S. Mandya was a student of Shree Kala Niketana School of Art, Mysore. His style of art is majorly figurative where he uses strong and forceful lines to vent out his inner feelings. Sujith started his artistic career with watercolours, but then he slowly shifted to other mediums and after three years of intense practice, he found his style and comfort with oil paints. His work has been featured in solo and group exhibitions such as Karnataka Chitra Kala Parishad, Bangalore, Birla Academy of Art, Kolkata and Indian Art Festival at Nehru Centre, Mumbai.. He has a multitude of art camps to his credit and his work adorns the homes of private collectors in India, Singapore and the USA.